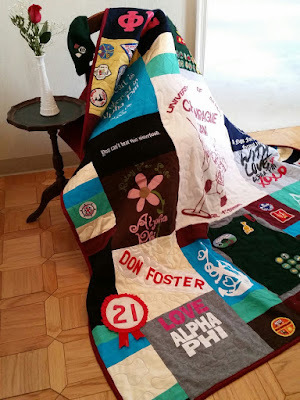 “My Story Quilt” is what this quilt is called by a very happy customer. Through tears she explained that the story begins with Girls Scouts in 1970-see the Girl Scout Vest, yellow jacket and patches sprinkled throughout, then comes her beauty pageants in the late 1970’s-see her 3 pageant banners and her cream colored gown that she wore. College is next with Alpha Phi and the many memories that Greek life provided! Simply beautiful is the story of her life!